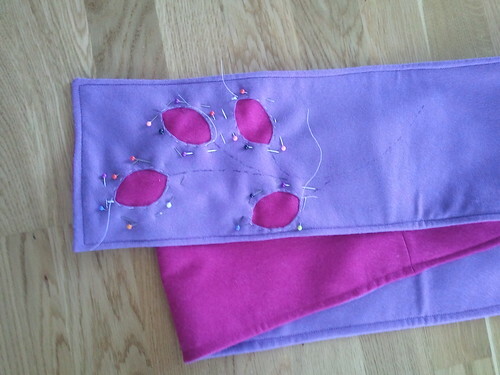 Embellished scarf – almost done! Next step was to cut out the leafs. That went fairly well, but again my cutting could be neater. Then I pinned and basted around the leaves. This was as far as I got yesterday before the baby awoke from her nap. 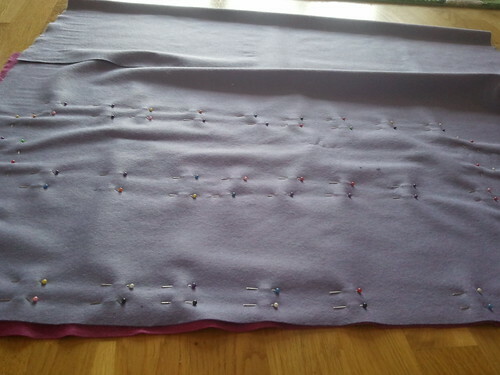 Today I started sewing the pattern on the sewing machine. 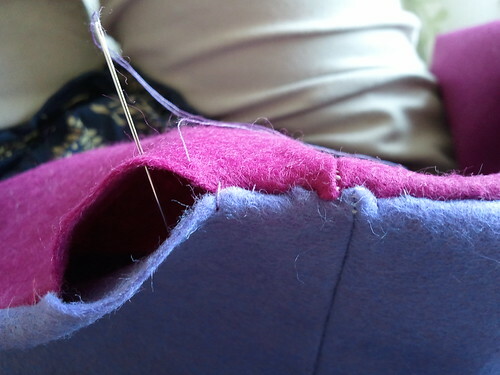 Before getting started on the actual sewing, I had to make sure the tension was right. This took a long time, and I was not completely happy with the result, but I think my machine is not any good, and I didn’t want to waste more time, so on I went with the sewing. 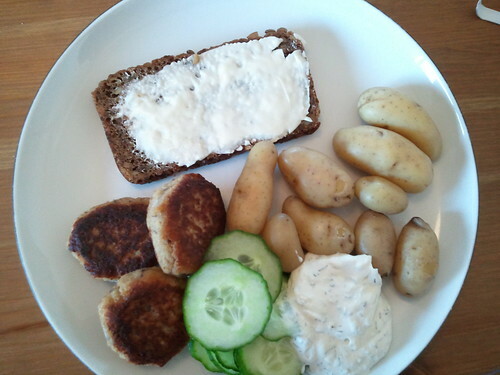 It was not easy, and the result could have been nicer, but for a first try, I am quite happy. And then there is of course also the other end of the scarf to embellish with the same pattern. The scarf that I am making has finally taking the shape of a scarf. 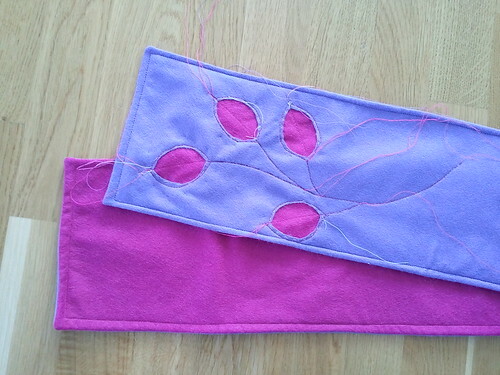 Now all I need to do is put the finishing touch ob it: the embellishing, which is a leafy pattern on each end. 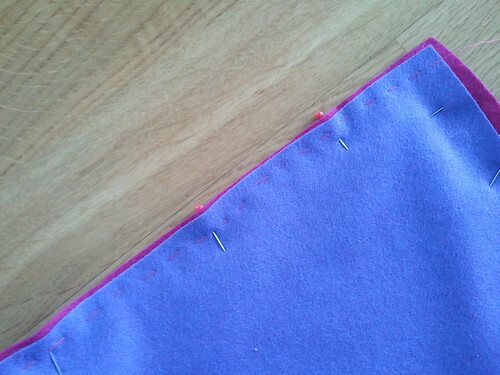 I didn’t have any major problems while sewing this time, but I do think my sewing could be a bit neater – I’m sure that part will come in time. Practice makes perfect, as they say. 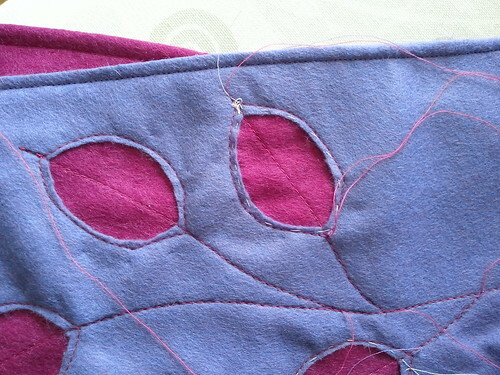 Here I had turned it – notice the gap in the middle that I had to slip-stitch closed. 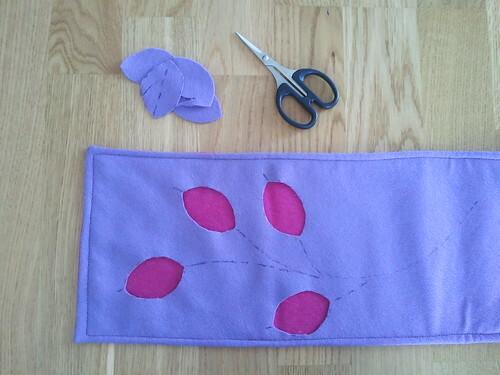 Now I just have to figure out if I can transfer the leafy pattern without dressmakers carbon-copy paper. Otherwise I will have to go buy some before I can continue. The weather is warmer and all the spring flowers are showing off their colours! We bought our house in July 2011 so this is the first time we see what our garden looks like in the spring. It is fun to see which flowers have been hiding under the surface and now peeking out and looking towards the spring sun. 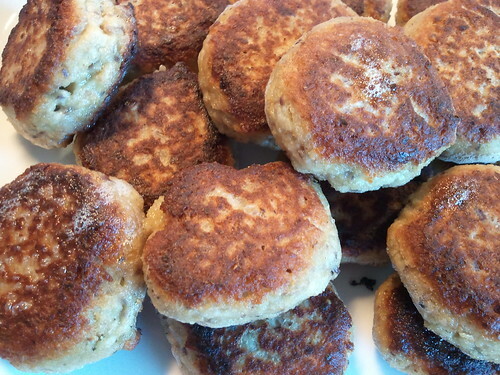 In Denmark we have an Easter tradition where children and young at heart send out a ‘gækkebrev’ before Easter to a friend or family member. It’s a paper cut letter with a little rhyme and accompanied by a snowdrop. The letter is anonymous and the senders name is spelled out with dots. The receiver then has to guess who send the letter. If they guess it, they get an Easter egg. Baby took a long nap today so I thought I would see how far I could get with the scarf. 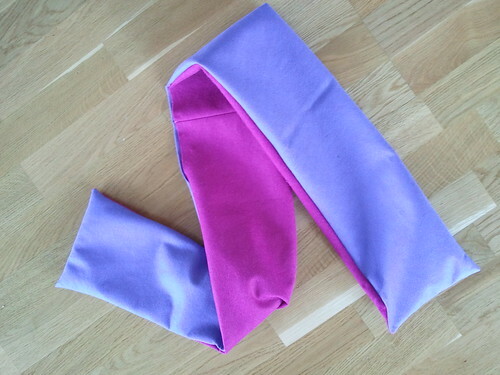 This is all about learning and first problem with the scarf project was that the fabric wasn’t wide enough. 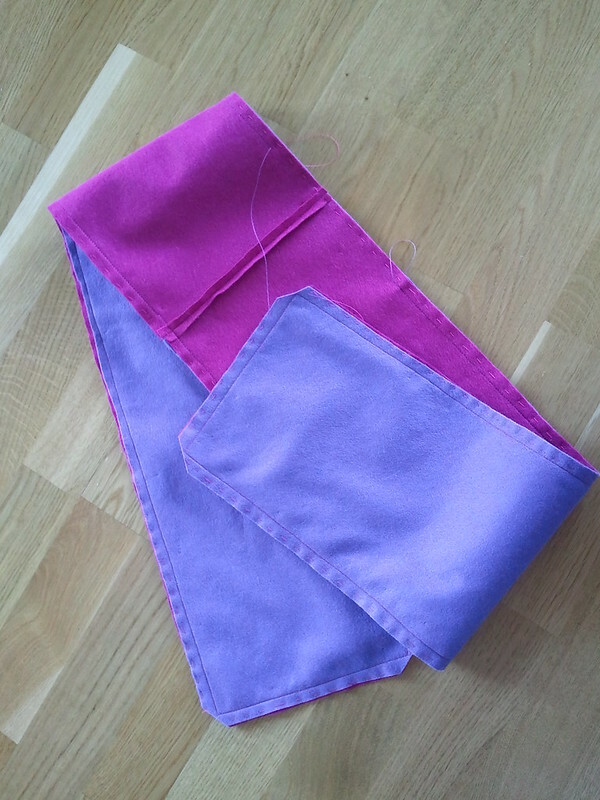 I had already noticed this when I was at the fabric store, so I had bought twice the amount and planned to sew two halves together. Time will tell if this was bad judgement on my side, or maybe my improvisation turn out okay. Second thing I noticed today was that I apparently can’t cut in a nice straight line. I could blame it on the scissors, but I guess I just haven’t got the experience of cutting fabric yet. 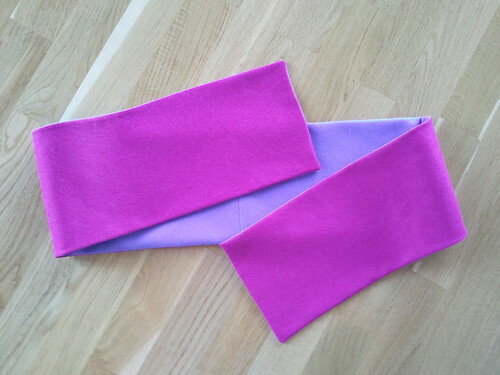 Also I probably shouldn’t have “cut corners” by doubling the fabric so I only had to cut once in stead of twice. Lesson learned: ‘Don’t cut corners when cutting fabric’. Third probable mistake was that I thought I could get away with using the thread already sitting in the machine to sew the two halves together. I think I might get away with it, but am actually a bit disappointed in myself for not spooling the correct colour and threading the machine according to the fabric. One thing I am proud of remembering is that I checked the thread tension on a scrap. And a good thing I did too, because it was way off. It actually took quite some tries before I got it right. 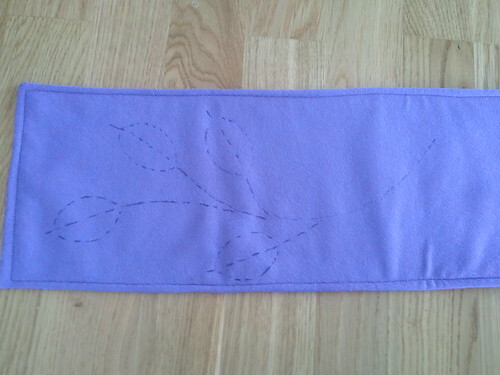 And a close-up (look at how off my cutting is, and my basting stitches could be neater). 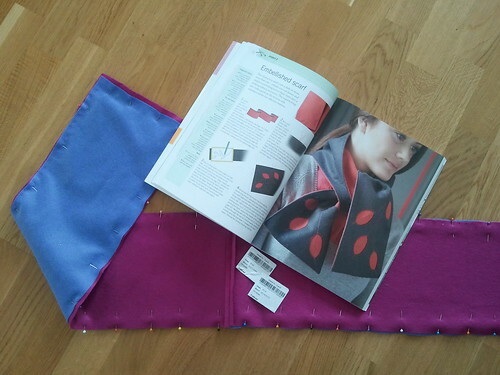 The second project in my learning-how-to-sew book is called “Embellished scarf”. It’s a two colour scarf with a leaf detail on each end. 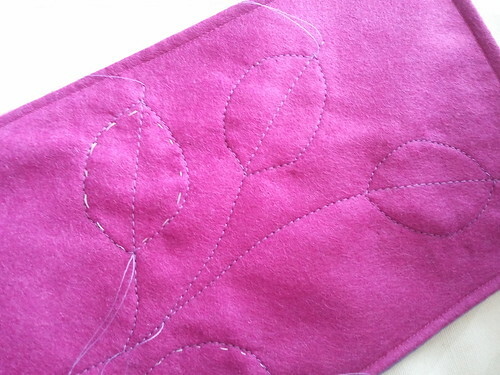 It says to use felt, boiled wool or fleece – I’ve chosen felt and decided on a light lilac and a fresh cherise. 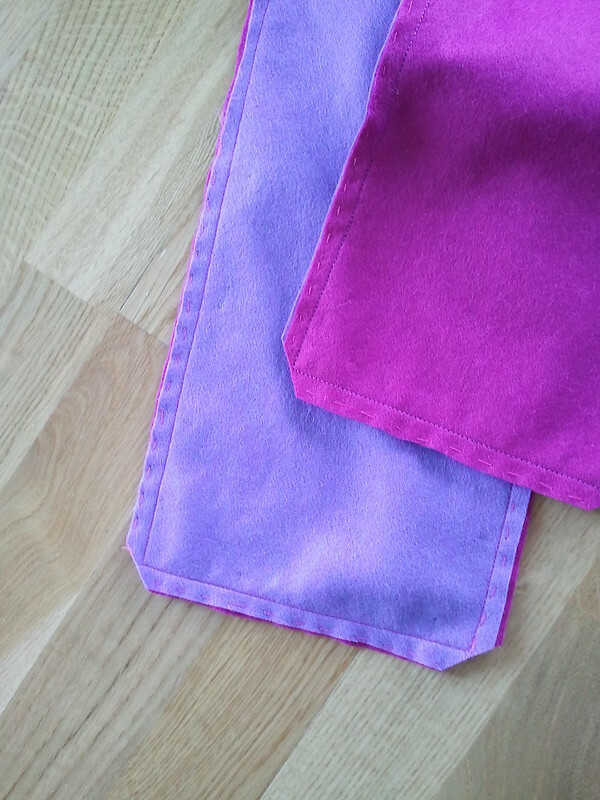 I bought some extra of the lilac felt so that I would have enough for the 4th project which is a bag; I thought it would be nice if the scarf and bag could match. 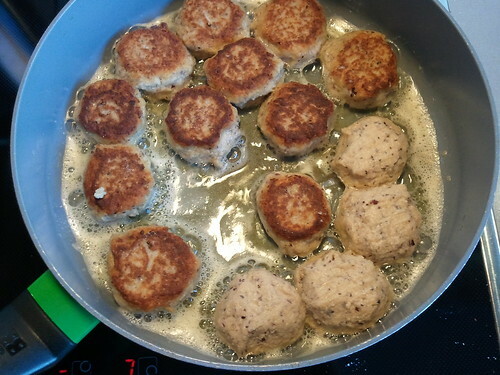 I went and used a small fortune today at Stoff & Stil in Malmö today. 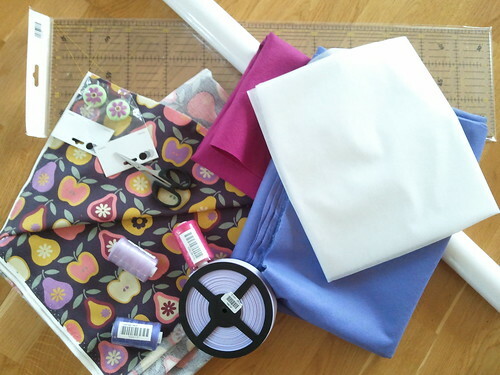 It is for the next 3 projects in my book on learning how to use a sewing machine, so if I spread the cost 3 ways I think it was an acceptable amount of money.